The Axon Mote is a multi-purpose robotics microcontroller designed by and for a robotics hobbyist. 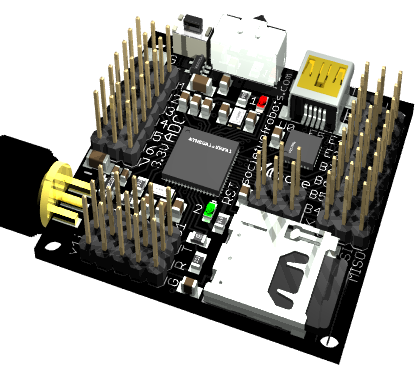 The Axon Mote is a multi-purpose wireless robotics microcontroller. It can be used as a datalogger, a wireless transceiver, or a robot controller. It is software compatible with the Axon microcontroller series. See the features page for more info. By purchasing product(s) from Society of Robots, you are thereby agreeing to not hold said website or owners and partners of said website responsible or liable for any and all harm, damage, or distress caused by said product(s). All disagreements must be settled outside of court. To reduce costs, items ship once per week. Receipts will only be included/emailed by special request - contact us. You may also purchase from one of our official dealers for additional purchasing/shipping options. For countries that are not supported by Paypal, you may send money by Western Union (contact SoR directly).